Today I'm sharing a recipe using one of my current favourite products, Good Berries powder by The Good Guru. 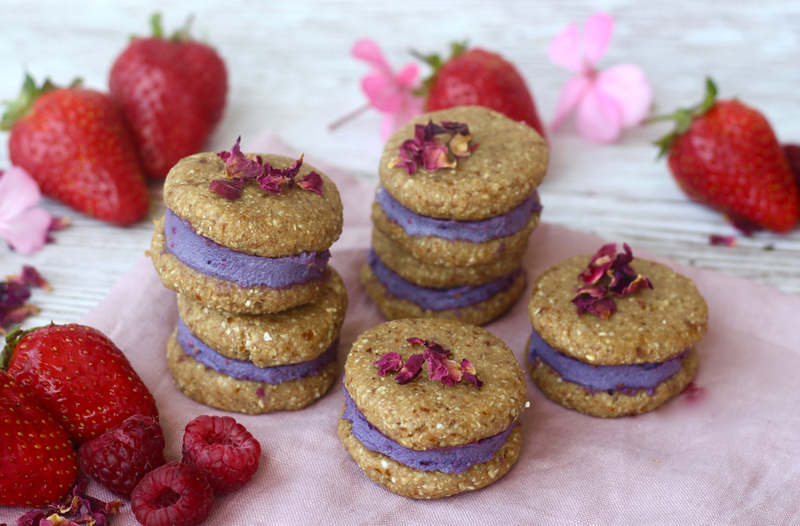 I've actually become quite obsessed with it over the last few weeks - I add it to porridge, I blend it into smoothies, I stir it into yogurt and I love incorporating into sweet recipes such as these amazing Raw Berry & Vanilla Sandwich Cookies. I love sandwich cookies, they always remind me of the classic oreo and I think they're such an indulgent treat. 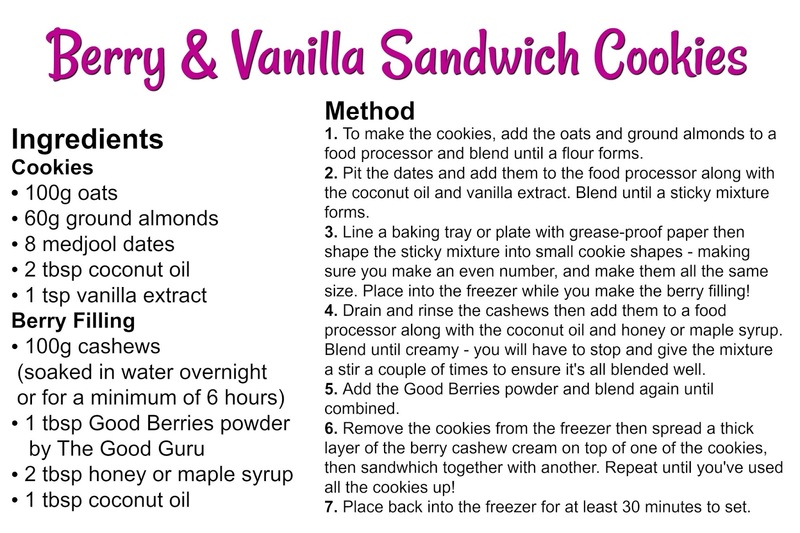 This recipe is the best sandwich cookie for Summer as it's not rich and chocolatey, it's not too heavy and the berry flavours just scream 'summer time'. The cookies are made simply out of oats, ground almonds, coconut oil, medjool dates and coconut oil. 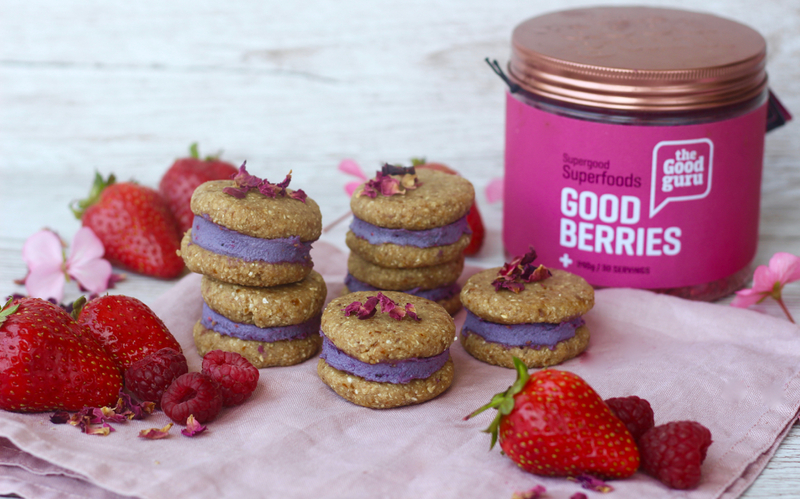 The creamy berry filling is made out of cashews, honey or maple syrup, coconut oil and the key ingredient Good Berries powder by The Good Guru, so really they couldn't be any more natural! I love the Good Berries powder in this recipe as it makes adding the berry flavour some easy and you get a combination of blueberry, blackberry, cranberry and strawberry in every serving. The dreamiest taste, the most beautiful colour and so many anti-oxidants!